Last summer, I had the opportunity to visit Corison Winery and sit down with the eponymous owner and winemaker herself. I can't believe it has taken me this long to finish writing this, but it has. Just as good wine deserves time, I guess writing about good wine takes time, too. Corison Winery is located in the St. Helena appellation of the Napa Valley. If you haven't heard of Corison, then you obviously haven't been reading much about the new wave of California wines. Not that the Corison wines are considered a part of the big burly low-acid cult Napa cabs, but these wines are often cited as the counterbalance to too much concentration and alcohol that some say plague Napa Valley cabernet today. For her efforts, Corison was also named the San Francisco Chronicle's Winemaker of the Year in 2011. Started in 1987 by Cathy and her husband, William Martin, Corison cabernet represents a wine that was contained in Cathy and "needed to get out after making wine for some many other people." 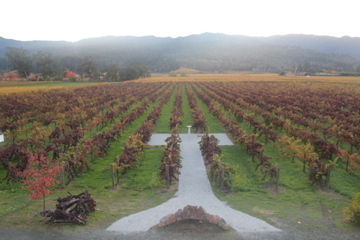 Corison makes two wines, the regular Napa Cabernet and the Kronos Vineyard Cabernet from estate-grown fruit. She also makes a gewürztraminer and a rosé under her Corazón label and a cabernet franc under the Helios brand. 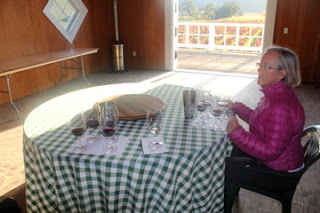 She showed me around the winery and vineyard and then we sat down to taste through a vertical of the Corison Cabernet. While we tasted, we just chatted. We didn't not discuss the wines in detail, but we just got to know each other. Not that many other Napa winemakers aren't personable, but Kathy reminded me of a friendly neighbor and a warm summer afternoon. Corison is a welcome throwback in the high speed world of Napa Valley wines. 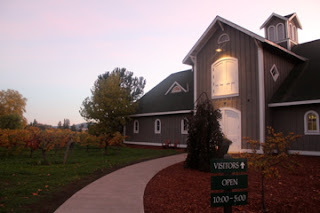 Her tasting room and winery are unpretentious and actually remind me of the unassuming winemaking facilities in Colorado. The tasting room consists of a wooden counter top on top of two barrels and a picnic table filled with festive visitors amongst the barrels of aging cabernet. Outside, the winery is surrounded by eight acres of forty-year old cabernet sauvignon vines still planted on low-yielding St. Georges rootstock. With the amount of replanting in the Napa Valley, this vineyard is truly a historic piece of property. The vines are head trained and planted with a very narrow spacing in a gravelly soil that Corison specifically sought. Corison dry farms the Kronos Vineyard except for watering the new young vines that are planted as needed when one of the original vines dies. Corison holds this land in the highest regard. After starting the winery in 1987, she made wine with grapes purchased from selected vineyards around the valley. However, she did want to make an estate wine, but only under perfect conditions for cabernet sauvignon. Namely, she wanted to find a vineyard with a specific soil profile. She waited until 1995 until she found an old vineyard with cabernet sauvignon grapes planted in Bale soil. Bale soil is a deep, poorly drained gravelly loam soil found on gently sloping alluvial fans around what is known as the Rutherford Bench. This soil type is perfect for old-world style winemaking because the soil holds on to water which allows the vineyard to be farmed without the aid of irrigation. Despite Corison's seemingly old-world winegrowing practices, she has really taken social media. In fact, Twitter was the way we connected. I sent Corison a tweet telling her that I would be in the area for a conference and wanted to know if I could meet her. She quickly replied and we communicated via Twitter until I arrived. Despite some in the wine industry not being sold on social media, Corison had great things to say about how Twitter has affected her business. She told me that she has found the technology a great resource for reaching a younger audience. Also, she said that perhaps the greatest advantage to using Twitter was getting plugged into wine writers, sommeliers and even other wineries. Not a day goes by when Corison doesn't interact with potential customers via her Twitter account. She told me about a tweet from a NY sommelier announcing that Corison Cabernet was being offered by the glass. She said the tweet went viral and many people contacted her about it before even she knew. Overall, Corison said that the community Twitter has allowed her to build with friends, colleagues and customers has been incredible. After all, isn't that what social media is really about? As we sip on four of her cabernets, I notice that the barn that her husband built is reminiscent of a theater. Corison of course is a theater buff and the stage above the winery has indeed hosted more than one play featuring her children. In fact, the sets for Oliver and Cats are on a moment's notice in storage above the barrel room. Every year around Christmas Corison's family takes a vacation. She told me that she was eagerly awaiting her trip to Florence, Italy. Yet, Corison doesn't just travel with her family, she goes with a small group of wine tasting friends. They've been to Rome and Saint-Émilion in years past. Her favorite parts of these journeys abroad are the history tours and the visits to the theater. And of course she always enjoys the wine. Speaking of wine, we had four glasses of cabernet sauvignon in front of us that complemented such lovely conversation. Corison was kind enough to open a vertical of her Napa Valley Cabernet from 2000-2003. My favorite of the bunch was the 2000. It provided intense aromas cherries and leather on the nose and with a beautiful minerality, bitter chocolate, cigar box, leather and truffle flavors with a long finish. The 2001 was a little more closed with slightly darker fruit on the nose and with strong acidity, tart raspberries, chocolate and a suggestion of orange peel on the palate. Corison's favorite of the day was the 2002 and I couldn't blame her with its deep intense aromas of wood and earth and bright flavors of cranberries and other red fruits with an almost chalky texture. Finally, the 2003 was the biggest and most masculine of the four. It reminded me of a Red Velvet cake with its raspberry and cherry fruitiness but with a backbone of grippy tannins, smoke and tobacco. The finish was long and densely filled with blackberries and raspberries. On the way out the door, I snuck a taste of the 2006 Kronos Vineyard Cabernet Sauvignon. The Kronos is made from estate-grown fruit and spends 12 extra months in barrel compared to the Corison Cabernet. You can smell the extra year in barrel with the added vanilla aromas. Despite the youth compared to the four other cabs I tasted, the Kronos was a burlier wine. Smoke, graphite, black fruit, blackberry, bacon, tobacco, leather and strong tannins are there for all to taste in this exceptionally textured yet not overpowering wine. As we were walking through the vineyard, Corison told me she likes to play with power and elegance in her wines. This deft balance is more than apparent as Corison's wines are both powerful and elegant.